Pink Kitty Treats HamperGP26Items may be substituted for similar if necessary. 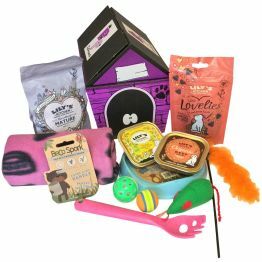 All edible treats are suitable for cats and ingredients are listed on the packets. Always ensure clean water is available when feeding treats to your pet. 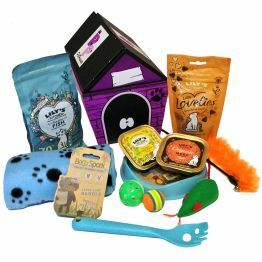 Would you like to treat your cat to a box of goodies that will keep them happy for weeks? 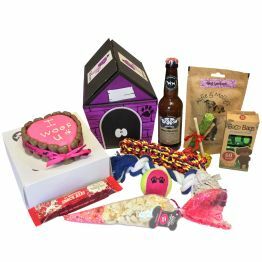 Well, this hamper is just what you are looking for. The Pink Treat Hamper for Cats contains a selection of treats and toys which have been put together to ensure your cat can enjoy an exciting lifestyle by preventing boredom whilst supporting a healthy diet. 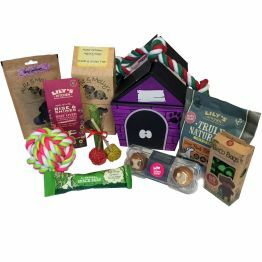 This hamper is an ideal gift for birthdays, Christmas or those times when you just want to treat your feline friend. 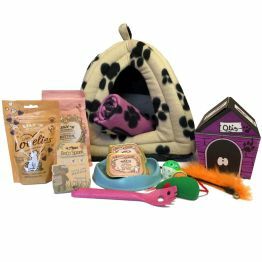 Pink fleece pet blanket Lily's Kitchen dried cat food Lily's Kitchen wet cat food packs x 2 (variety of flavours) Lily's Kitchen Little Lovelies Pink Beco Bowl Pink Beco Spork Cat wand toy Selection of three cat toys ( may include balls, catnip mice) All edible treats are suitable for cats and ingredients are listed on the packs.